Italian specialties made with the freshest ingredients. At La Dolce Vita, we know you are sometimes to busy to make your lunch or dinner. That’s why make a variety of food each day with the freshest ingredients. 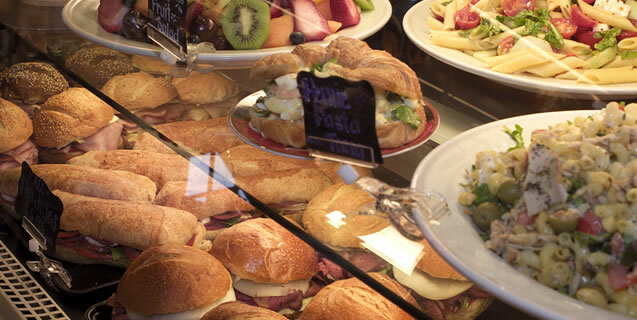 Stop by and you will see mouth-watering sandwiches using the best produce, meats, and made with our breads. We always create a selection of salads that are as beautiful to look at as they are to eat. You can also find various Italian specialties like lasagna, arancini, and a few other surprises. Bacon, Eggs and Cheese Sandwich — Made with 2 eggs on your choice of a bagel, roll or croissant. Eggs, Feta and Spinach — Made with 2 eggs on your choice of a bagel, roll or croissant. Sausage, Eggs and Cheese — Made with 2 eggs on your choice of a bagel, roll or croissant. Ham, Eggs and Cheese — Made with 2 eggs on your choice of a bagel, roll or croissant. We make a variety of Homemade Soups fresh in our kitchen. The selection varies daily. Each size of soup is served with one of freshly baked roll. All of our delicious sandwiches are made on our homemade rolls baked fresh daily. Everything is available by order. Please feel free to order a day or two in advance and ask about our Sandwich Trays. Italian Panino — Mortadella, Salami, Provolone and Prosciutto laying on a bed of lettuce tomatoes and arugula. A splash of Italian olive oil. Turkey BLT — Turkey, bacon and American cheese laying in a bed of lettuce and tomatoes with mayo. Roast beef BLT — Roast beef, bacon and Swiss cheese with lettuce tomatoes and mayo. Ham BLT — Ham, Bacon and American cheese with lettuce tomato and mayo. Veggie Panino — Grilled Eggplant, red peppers and zucchini laying on a bed of Arugola and splash of olive oil. Fresh Tomato and Mozzarella Panino — Tomatoes and Fresh Mozzarella laying on a bed of Arugula and Basil with a splash of olive oil. All our delicious sandwiches are made on our homemade rolls baked fresh daily. Golden Gate — Turkey, American cheese and caramelized onions with a delicious avocado spread grilled on a press. Grilled Pastrami — Pastrami, American cheese and caramelized onions with a spread of mayo and mustard. Chicken and Broccoli Melt — Grilled Chicken, sundried tomatoes and Broccoli with three types of cheese grilled on a press. Tuna Melt — Tuna, mayo and three types of cheese grilled on a press. Four Cheese Melt — Provolone, Cheddar, Swiss and American cheese gilled on a press. These are usually available, but not always. Arancine — Rice balls with meat sauce center. Stuffed Breads — Mixed meats or veggie. Fresh Pizza — Mixed meats or veggie.